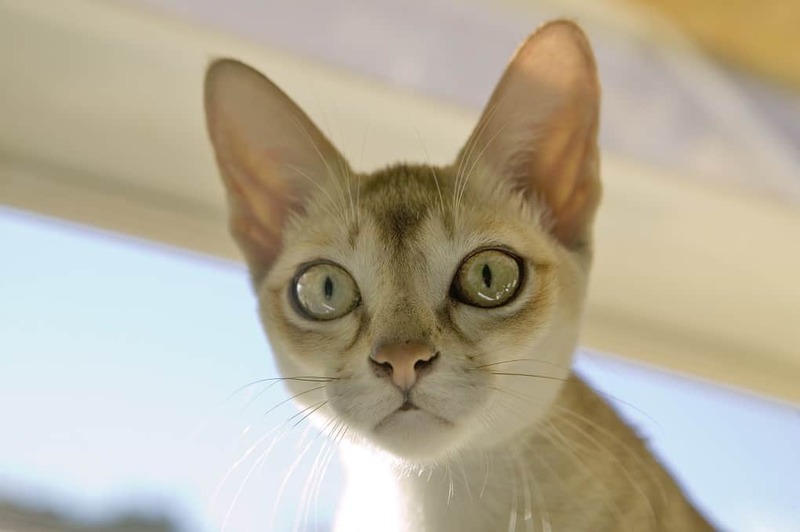 If you are on the hunt for a new pet cat, you may already have looked at the Singapura cat. These cats are very small, cute, and they make for great house pets; however, they do need care and lots of attention, as they are high-energy cats. Let’s go over everything you need to know about the Singapura Cat, just in case you decide to get one. How much does a Singapura Cat cost? The Singapura cat is a very active and mischievous cat. These cats will spend their days running around the house, climbing curtains, getting on top of the fridge, destroying toilet paper rolls, and just love getting into trouble in general. They are super playful cats, which is a trait that they keep into their adult lives. Playing with toys and pretending to hunt are favorite pastimes of the Singapura cat. These cats love people, they love meeting new people, and when they are not causing trouble, they don’t mind sitting in a lap and getting cozy with more or less anybody. They are also affectionate and often sit with their owners when they realize that people are sad or sick. The Singapura cat is a cat breed which was developed in Singapore throughout the 1970s. Hal and Tommy Meadow were cat fanciers, and had various cats from Singapore which they bred to create the Singapura cat breed. It is likely, although unproven, that these cats are related to Siamese and Burmese cats, which is based on their colors and look. In terms of DNA testing, there appears to be little to no genetic difference between the Singapura cat, Siamese, and Burmese cats. It is actually somewhat unclear as to the ancestry of this cat, but that will have to remain a mystery. In 1988, the Cat Fanciers Association officially recognized the Singapura cat breed. For the most part, the Singapura cat is a healthy cat and is not known to suffer from many major health issues. One of the only things which this cat breed may suffer from is called pyruvate kinase deficiency or PKD. It’s a complicated disease characterized by a deficiency in an enzyme which is needed for red blood cell metabolism and often results in hemolytic anemia. However, most Singapura cats with PKD can live a normal life. Other than that, just provide them with lots of opportunities for exercise and feed them well, as they have been known to get a little chunky. The Singapura cat is not too difficult to care for in terms of grooming. Using a soft brush to remove dead hair about once per week should be more than enough. You can also use a chamois to polish them. They rarely require baths unless they get exceedingly dirty or smell, and baths are actually not good for their coats or skin. Other than that, you want to clean out their ears with a wet cotton ball (50% water/50% cider vinegar) about once per week, and use a wet cloth to wipe their eyes about once per week. There’s not much else needed in terms of grooming the Singapura cat. The Singapura cat is a very short, stalky, and muscular cat, one with a relatively large and round head, with large and pointed ears. These cats are known for being one of the smallest breeds out there, rarely reaching over 8 inches in height at the shoulders, with smaller ones and females even being a couple of inches shorter. Just like with their height and size, the Singapura cat is also known for being one of the lightest cats out there in terms of weight. Male Singapura cats will usually top out at around 6 pounds, with smaller females being known to weigh as little as 4 pounds when fully grown and mature. They are one of the smallest domestic cat breeds today. The Singapura cat is super active. They have a very high energy level, they are mischievous, smart, and love to cause trouble. All of this comes together in a cat that is always on the move, playing around, and getting into all kinds of trouble. It’s definitely not the type of cat to get if you want a low energy cat that does not require much attention. 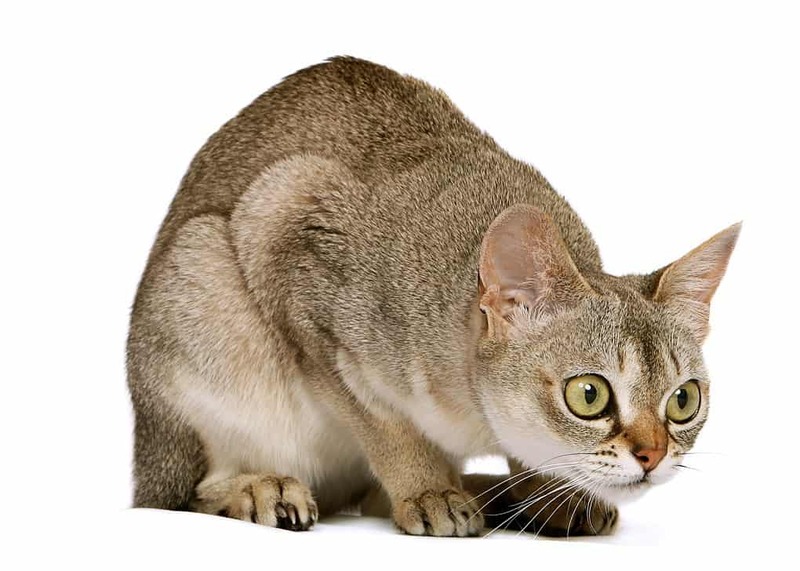 Technically speaking, the Singapura cat is not a hypoallergenic cat and they have been known to cause allergic reactions in people who already suffer from allergies. However, they have short coats, are easy to groom, and are so small that they do not produce all that much dander, so if you have allergies, there are worse options you could go with. 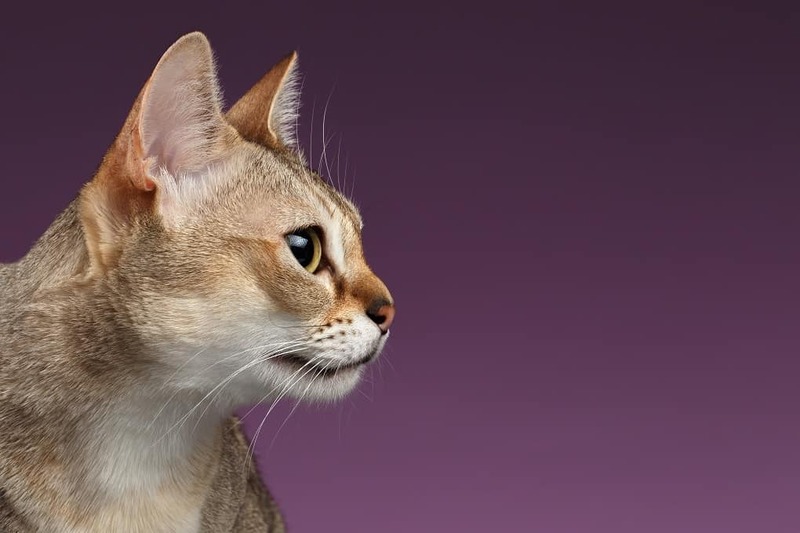 The Singapura cat is pretty average in terms of lifespan when it comes to domestic cat breeds. If well cared for, the Singapura cat should live to around 15 years of age, with anywhere between 11 and 17 years old being possible. While grooming is not a big necessity here, the Singapura cat is picky about its litter box being kept super clean at all times. The most difficult part about caring for the Singapura cat is that it is very active, loves to play, get into boxes and cupboards, and just cause trouble in general. They are friendly cats, but be ready to clean up some messes of shredded boxes and unraveled balls of string. The Singapura cat is fairly common among North American and European breeders. As is the case with any purebred cat, you do want to get it from a legitimate breeder, one that is proven to produce healthy kittens, with papers that can be certified. They can sometimes be found in shelters, but this is really the case with all cats. It is recommended that you go to a trusted breeder to find them. Of course, there are also breeders in Asia, but more so in Europe and North America. Your average Singapura kitten can cost anywhere between $800 and $1,500, depending on the breeder and your location. However, cats from distinguished breeding lines can run a good few hundred dollars extra. When it comes down to it, as long as you go to a reputable breeder that has shown to produce healthy offspring, choosing the right type of Singapura cat really just comes down to the color and pattern which you like the most. In terms of requirements, they really do not require anything that any other cat breed doesn’t need. Regular grooming, a clean litter box, a healthy diet, lots of toys, and scratching posts to keep them busy is what the Singapura cat requires. While their maintenance needs are generally quite low, the Singapura cat does need a lot of attention. If you leave them to their own devices, your boxes, balls of string, curtains, and furniture will all get scratched up. They love to play, hunt, jump, and climb. The Singapura cat is a very friendly and social cat. They love people and they like meeting new people. Of course, the favorite pastime of the Singapura cat is to jump around, climb on stuff, hunt for toys, and the like. However, they also enjoy the occasional snuggle when they are worn out from messing about all day. The Singapura cat only comes in a single pattern, which is characterized by bands of light and dark ticking, with a dark tail. This is a sepia-toned cat with a muslin-colored muzzle, chin, chest, and stomach. The Singapura cat is affectionate enough. They have no problems with being snuggled or sitting on a lap, but with that said, they would still rather play and get into trouble more than anything else. The Singapura cat is friendly enough with dogs and kids. As long as the kids and dogs are not harassing the Singapura cat, it should all be just fine. The Singapura cat is known for being moderately intelligent. It is not the smartest of all domestic cat breeds, but it certainly holds its own. They are not big into puzzles or problem solving, but they can be quite adventurous, tricky, and mischievous when they have a certain goal in mind. As mentioned before, the Singapura cat is a very high-energy cat. When you get home, it might just jump onto your shoulders and hitch a ride. They will spend all day jumping onto window sills, climbing atop the fridge, scaling your curtains, and hunting toys around the house. They are high-energy cats, no doubt. The Singapura cat is a fairly low-maintenance cat in terms of grooming, but when it comes to affection and the need for adventure and play, they do need a lot. As mentioned in passing above, the Singapura cat only comes in a single pattern, which is characterized by bands of light and dark ticking, with a dark tail. This is a sepia-toned cat with a muslin-colored muzzle, chin, chest, and stomach. They usually never come in any other colors or patterns. The Singapura is a very good family cat that usually does fine with kids and other pets. Their grooming needs are minimal, but they do require a lot of attention and toys to stay out of trouble.